Dee Brown’s elegiac story of the Native American’s war with the white man, Bury My Heart at Wounded Knee, was the number one New York Times best-seller for weeks, and has sold millions of copies all over the world since its first publication in 1970. When we worked together in 1968, Dee was known primarily as a serious historian and a good storyteller, but his many previous titles had relatively modest sales. In contrast, Bury My Heart at Wounded Knee was right book at the right time — beautifully reviewed, and welcomed enthusiastically by a broad market that was ready for a heart-breaking, passionate book about the terrible destruction of the Indians, that awful legacy of our American history. Bury My Heart was a real game-changer. 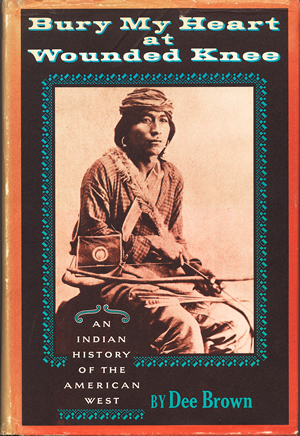 After its publication, the term Indian was replaced by Native American and our universal perception of what had really happened to the indigenous people of North America was changed forever. Dee told me that the best part of this terrific success and big bucks so late in his life was that his son finally understood and appreciated him for who he was, and proud of what his dad had done. What father could ask for more? Dee Brown died in 2002 at the age of 94.